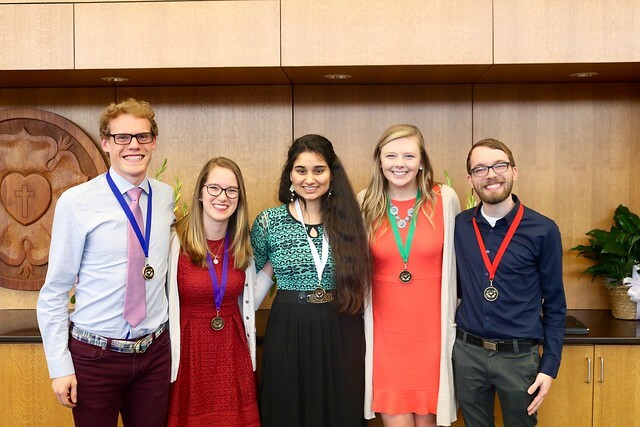 Five students were recognized for their exemplary commitment to the values of Christian faith, the liberal arts, academic excellence, community and service, respectively, at Augustana’s 2019 Covenant Award ceremony, held Friday, April 5 on campus. The ceremony was part of Verdier 2019, a week-long celebration of the core values that serve as the foundation for Augustana’s academic and student life programs. A significant tradition at Augustana, the Covenant Awards are named in honor of each of the University’s five core values: Christian, Liberal Arts, Excellence, Community and Service. A committee of faculty and staff review nominations from the entire campus community. Blom is a senior from Pipestone, Minnesota. Her majors are journalism, communications studies/business and Spanish. Nominees for the Covenant Award for Excellence are those who commit themselves to high virtuous and ethical standards, personal integrity, human excellence, self-discipline, and self-improvement. These nominees are known for bringing out excellence in others. Their commitment to excellence has shaped their plans for the future. Nominees for the Covenant Award for Christian Faith are those who, during their time at Augustana, have searched for a calling that honors the Christian faith; who actively integrate faith and actions; who see their life journey as part of a bigger tapestry; who are growing in faith; and who are comfortable discussing their faith with others. Varpness is a senior from Montevideo, Minnesota. She is majoring in religion and communication studies, with minors in classical studies and philosophy. Nominees for the Covenant Award for Community are described as those who have demonstrated and fostered respect for others; who act as a leader, earning the respect of others; who have left a mark on the campus and broader communities; and whose commitment to community has shaped their plans for the future. Kumar is a junior from Ghaziabad, India. She is studying biology and philosophy with a minor in psychology. Jaton is a senior from Sioux Falls. His majors are music and classics, and his minors are math and physics.